Douglas Bradburn, the founding director of the Fred W. Smith National Library for the Study of George Washington at Mount Vernon, will be the keynote speaker at the annual meeting of Washington and Lee University’s Friends of the Library on Saturday 3 May. His talk, “A Presidential Library Like No Other: George Washington’s National Library at Mount Vernon,” will begin at 1:30 PM in Northen Auditorium in Leyburn Library. It is free and open to the public. Immediately preceding Bradburn’s talk, at 1:00 PM, the Friends of the Library will hold their annual meeting and award presentation. After his talk, Leyburn Library’s Special Collections will open its doors for a showcase of George Washington material. Washington and Lee University’s Special Collections and Archives will present the American Library Association webinar “Low-Cost Ways to Preserve Family Archives” at 2:00 PM on Tuesday 29 April in Leyburn Library’s Northen Auditorium. Library staff will be available for individual consultation after the showing. This event is free and open to the public. Contact Alston Cobourn at cobourna@wlu.edu or 540-458-8657 with questions. During Spring Term the Writing Center in Leyburn Library is not open regular hours. However, many of our tutors are available for individual conferences. Their names are posted in the Center (Room M11) and on the Writing Center web site. W&L students are welcome to send an e-mail to any of the tutors to set up an appointment. They will be paid for the time they spend working with you. The University Library is very happy to welcome about 200 accepted students and their families to Washington and Lee University for Accepted Students Day on Wednesday 23 April. We hope our guests will stop by Leyburn Library and/or Telford Science to take a break from the schedule of activities and/or to ask any questions about W&L libraries or campus life. Anticipating one question: Yes, we are open to students 24 hours a day, 7 days a week while classes are in session. The long march of college admission is almost over! 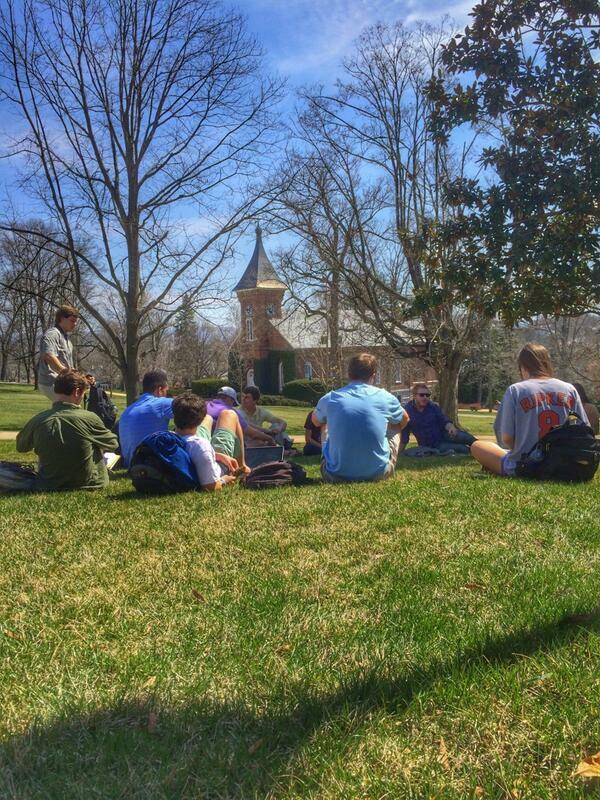 We hope you enjoy this week’s visit to W&L — and look forward to seeing you again in the fall. The computing lab in Room 101 on Lower Level 1 of Leyburn Library is now an all-Mac facility. Refurbished and re-equipped over Spring Break, the lab now contains 14 Mac machines with dual monitors. Some of you may have seen an article in the Richmond Times-Dispatch about the possibility of “Old George” (or a copy thereof) taking to the road. Rest assured that the original “Old George,”repaired and restored, continues to reside in the Boatwright Room within Leyburn Library’s Special Collections area. Even today, 170 years after his original ascent in 1844 above the building now known as Washington Hall, students and other researchers continue to work under his serious gaze. There is absolutely no truth to the rumor that the fire alarm in Leyburn Library has been set off by a faculty member’s fiery rhetoric in one of the classrooms. The alarm sounded both Thursday evening and around noon on Friday. These were NOT drills. In each case, the alarm was triggered by a faulty elevator mechanism, which currently is being repaired. Remember: Whenever this alarm does sound, all students and other visitors in the building should evacuate immediately and wait until W&L Public Safety officials authorize re-entry.